When a patient is diagnosed with cancer, the treatment plan selected by the clinical team typically depends on the type of cancer. Put very simply, breast cancer receives one treatment plan, while lung cancer receives another. However, times are changing. In fact, a paradigm shift in cancer treatment is evident in drug development projects, Food and Drug Administration (FDA) approvals, and clinical trials. Modern cancer therapies are being developed to reprogram specific immune responses, as opposed to targeting specific tissue types. 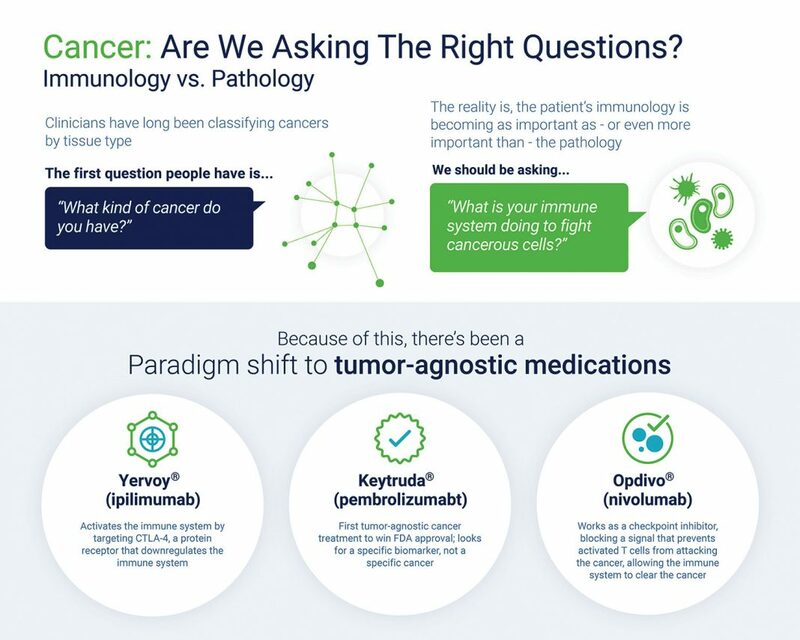 Rather than asking, “What type of cancer does the patient have?” clinicians are starting to ask, “Can we help the patient’s immune system fight their cancer?” While we are not fully there yet, this approach of tumor-agnostic treatments is critical as we embrace the era of cancer immunotherapy, so that cancer therapy can be taken to the next level. Our understanding of the immune system has evolved. When the immune system is completely healthy, it efficiently protects the host from pathogens and neutralizes infections. However, when the immune system is compromised, disease develops. Though with some diseases, the immune system becomes the enemy—cancer is one of those diseases. Traditional cancer treatments often focus on the pathology—the tissue type (epithelial, sarcoma, etc.) and site of cancer (e.g., lung, breast, skin, etc.). When focusing therapeutic choices on the pathology, we are not leveraging the most powerful tool in the body: the immune system. In fact, many of the therapies targeting cancer by tissue type weaken the immune system, which is one reason why traditional cancer treatments often fail. Because one of the most important weapons patients have against cancer is their immune response, we should be using therapies that improve the immune function, not weaken it. Focusing on the immunology, rather than the pathology, seems to be a better approach to treating cancer. This is the promise of immunotherapy, which harnesses the power of the immune system. Modern immuno-oncology therapies have provided hope where there was only despair. Cancer often results if immune surveillance fails. For example, cancer may become invisible to natural killer (NK) cells, which represent the segment of the immune system responsible for immune surveillance. Hidden from the immune system, cancer may grow, thrive, and ultimately kill the host. Cancer does not confine its treachery to simply hiding from NK and T cells—the “effector cells” that are activated to defend the body during an immune response and kill cancer. Cancer also subverts the patient’s immune system to develop “protector” cells that surround the tumor and keep the effector cells at bay. This protector system consists of myeloid-derived suppressor cells (MDSCs), tumor-associated macrophages (TAMs), and cancer-associated fibroblasts (CAFs). These cells actively secrete cytokines that signal each other and cells of other types to form an immunosuppressive shield around the tumor. By shutting down immune surveillance and putting up an immunosuppressive shield, cancer throws a one-two punch. This combination—evading the effectors and building up the protectors—allows cancer to survive and thrive. The one-two immunological scenario means that there are two targets for immunotherapy. We need to “wake up” the inert effector cells so that they will attack the tumor, and we must destroy the protector cells that are responsible for the immunosuppressive shield surrounding the tumor. So far, immunotherapy has focused on improving effector cell function. That solves only half of the problem. You can have the most potent NK cells in the universe, but they are useless if they cannot enter the tumor to kill the cancer cells. Modern cancer immunotherapy must hit both of its targets. This means combination immunotherapy is the future of cancer care. Immunotherapy should be targeted to fix the problems in the immune system. This is precision immunotherapy, and the FDA agrees with this methodology. In the last decade, we have seen a number of tumor-agnostic drugs that are taking this very approach. Keytruda® (pembrolizumab) was approved by the FDA on May 23, 2017, for the treatment of unresectable or metastatic solid tumors that have been identified as having microsatellite instability-high (MSI-H) or mismatch repair deficiency (dMMR). Although the FDA had previously approved drugs based on biomarkers, these drugs had been approved for specific biomarker-positive tumor types. The pembrolizumab approval was the first and only time to date that the FDA approved a cancer treatment based on a common biomarker alone, rather than the location in the body where the tumor originated. Opdivo® (nivolumab) is a checkpoint inhibitor that blocks the interaction between biomarkers PD-1, PD-L1, and PD-L2 that would have prevented activated T cells from attacking a cancer, resulting in decreased tumor growth. To date, nivolumab has been FDA approved for the treatment of several cancers including melanoma, squamous cell lung cancer, renal cell carcinoma, and classical Hodgkin lymphoma. Yervoy® (ipilimumab) activates the immune system by targeting CTLA-4, a protein receptor on the surface of T cells that downregulates immune responses by functioning as an immune checkpoint inhibitor. Ipilimumab stimulates T cells and thereby helps fight cancer and other diseases. The drug received FDA approval for the treatment of melanoma and is undergoing clinical trials for non-small cell lung carcinoma, small cell lung cancer, bladder cancer, and prostate cancer. While pembrolizumab is still the only drug that has FDA approval as a tumor-agnostic therapy, ipilimumab and nivolumab are two examples of the direction in which cancer treatment is headed: immunotherapies that target immunological biomarkers. Checkpoint inhibitors have received their many approvals using a traditional tumor-by-tumor clinical trial approach (one trial in melanoma, another in lung cancer, etc.). Change comes slowly. In the future, we can expect to see more drugs to be approved based on immunology, not pathology. While we certainly see a shift in mindset from pathology to immunology when it comes to cancer treatment, we need to embrace this approach further to see its full potential. Remission rates will not improve if we ignore the immune system’s potential as a full partner in treating cancer. In my mind, it should be the senior partner! If we fix the immune system, the type of tumor will not matter; the immune system will fight our cancers, no matter where they are lodged. Torque, a developer of T-cell cancer therapeutics produced through its Deep-Priming™ technology platform, said it has created a manufacturing process that will produce its T-cell cancer therapies and deliver them to patients much more quickly and inexpensively than current methods. The company announced that its Slipstream™ process for making Deep-Primed T Cells is in place at the GMP facility of University of California, Davis, which has collaborated with the company on the manufacturing platform through a partnership whose value has not been disclosed. Raymond J. Tesi, M.D. (rtesi@inmunebio.com), is CEO and CMO at INmune Bio, an immunotherapy company developing treatments to reprogram the patient’s innate immune system.